Efficiently separating water from crude oil – oil demulsification – can be a significant issue for producers. In principal, the operator has three main options: allow enough time for gravity to settle out the free water, add chemical demulsifiers, or apply heat. Envirovault is developing new ThermoVault designs that can double or triple the input heat. Usually, a combination of these methods is used. From a practical standpoint, today’s production engineer often has to choose a treating strategy that balances CAPEX and OPEX: The most capital-intensive approach is to build a multi-million dollar central oil treatment battery with glycol heaters or heater treaters, as well as pipeline tie-in to each satellite well pad. The opposite approach is to construct a basic tank battery and truck fluid to a third party processor for a fee. However, trucking fluid full of water is inherently wasteful. Central batteries often operate at less than full capacity and may not be an option for smaller operators, especially today when capital budgets are being cut back. Canadian producers looking to increase efficiency and improve the quality of their crude to pipeline grade often apply heat. 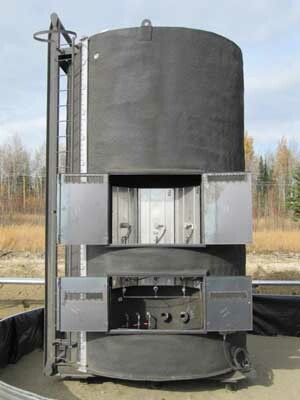 Heavy oil producers generally opt to tank treat on-site by heating the oil in the tank with a fire tube. But until recently this option has not been available to light oil producers. 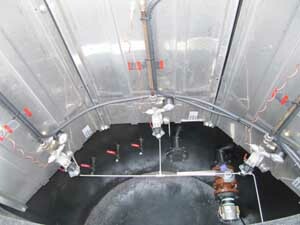 “Fire-tube heater treaters that have a flame mounted inside the tank are not safe to use with the more volatile compounds ”, says Kevin Heal, Director of Business Development for Calgary-based EnviroVault, makers of the ThermoVault, a safe and efficient light oil on-site tank treating system that raises and maintains fluid temperature. “A heater treater requires a burner management system that is expensive to maintain and now, with new regulations coming into effect, has to be certified annually, at considerable cost,” said Heal. ThermoVault is most effective for 25 o to 45o API oil. The ThermoVault incorporates large catalytic heaters – instead of fire tubes – that use a chemical reaction to crack the gas and produce heat evenly, allowing the operator to maintain a steady temperature with the least amount of fuel. The system uses a super-sized EnviroVault recessed chamber design: The storage chamber is placed inside an outer shell that provides excellent insulation, protecting the tank from the elements and minimizing heat loss. Heal also points out that too much heat will burn off the light ends of the crude, reducing the value of the product. “It’s like burning money,” he said. The ThermoVault is most effective for 25 o to 45o API oil. The standard ThermoVault uses three six-feet by two-feet Cata-Dyne® heaters with a combined input heat of 180,000 Btus per hour – and provide 36 square feet of surface contact with the wall of the tank. An operator can set the heaters to achieve exactly the temperature and heat distribution he wants. Currently the company is developing new ThermoVault designs that can double or triple the input heat. “Our customers are asking for larger tanks and more throughput capacity without taking up more space on the lease,” said Heal. The post Oil demulsification and challenges for Alberta producers appeared first on Beacon Energy News.